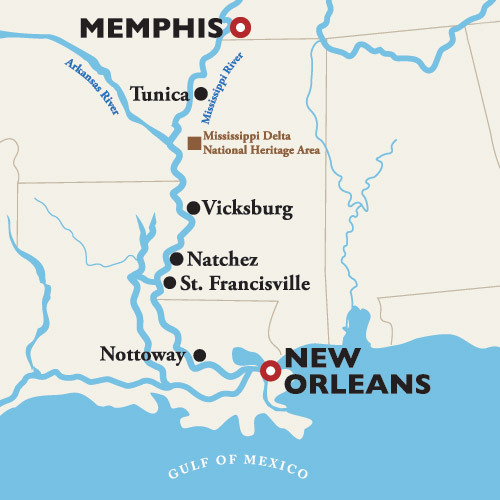 Please note: The April 21, 2019 departure has an altered itinerary due to high water on the Mississippi River and inaccessible ports. The official Voyage Check-in will be open between 9:00 AM and 12:00 PM located in the Pre-Cruise Hotel. During this fast and easy procedure, our representatives will arrange your transfer to the vessel and answer any questions you might have. The process is simple and will have you back to exploring in no time and, if you think of any more questions, the Hospitality Desk will be at your service until 3:00 PM, when the complimentary boat transfers will begin. The structure was built in 1819 and has a beautiful open layout. Now, the building is used as a market center for the towns’ local artisans and craftsmen to showcase their products and host their small businesses. Every day is different, you may see anything from jewelry and makeup, scarves and dresses or snacks and produce.